Clover Boot Disk includes tools to help you create a USB install MacOS Sierra on Windows. You can create a USB install MacOS on just a few clicks. Clover Boot Disk includes 3 files. This is a partition image of Clover. This is a partition image of MacOS Sierra installer. Download all the files at OneDrive. Because the image of the install MacOS partition size larger than 4GB, you can not contain it on a FAT32 partition. Copy the two files Clover.img and OSX_10.12.5_Installer.hfs to the NTFS partition above. You will need a USB least 8GB to store these files. Select Clover.img at 1, Type is FAT32. Select OSX_10.12.5_Installer.hfs at 2, Type is HFS/HFS+. 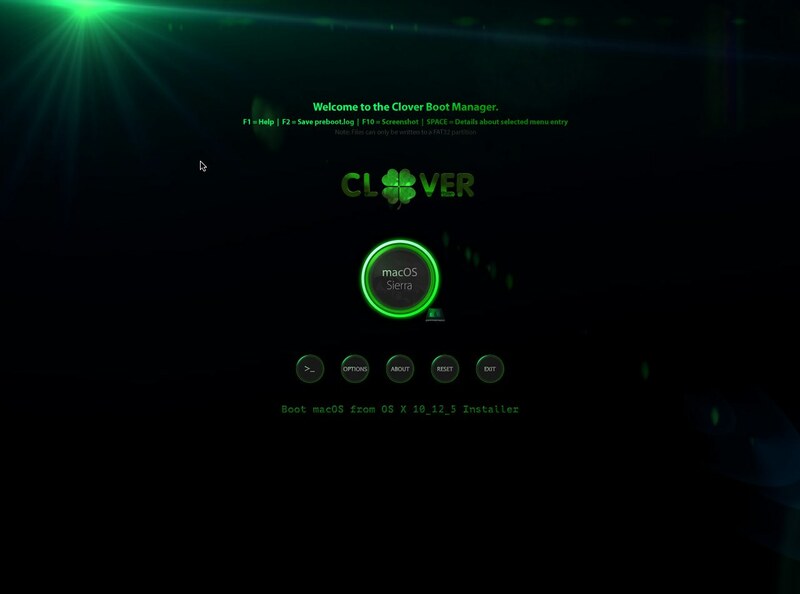 Check Clover to enable booting Clover in Legacy BIOS mode. Click the button MAP . Note: If an error occurs when selecting the file, please defrag for the file first and then try again. After clicking the MAP button, the tool will set up the new partition on the USB and create a backup file with the .MBR extension. If you want to restore USB as before, run PartIMGMapper.exe, click on UNMAP and select the previously .MBR file that was backed up. Now you will see the Clover partition, you can copy KEXT to the /EFI/CLOVER/kexts/Other directory and edit the Clover configuration in /EFI/CLOVER/config.plist. Read and write HFS+ on Ubuntu Linux. Edited by nguyentu, 19 May 2017 - 11:26 PM. Will 'PartIMGMapper.exe' save backup file with the .MBR extension within newly created FAT32 Clover Partition ? The backup file will be located in the same directory as PartIMGMapper.exe. You can move it where you want. You mean 'PartIMGMapper.exe' should be outside of USB Drive we are dealing with ? It will be nice if 'PartIMGMapper' can also save the current MBR of USB Drive to LBA 30 before switching to CLOVER and SIERRA Partition Image ? It will help in case of damage of .MBR backup file ? Can above CLOVER setup also boot in UEFI+GPT based Official MacBook Pro/Air ? From where you got 'OSX_10.12.5_Installer.hfs' ? I have 'Install macOS Sierra.app' in my Windows system which I copied from a Mac. How I can get 'OSX_10.12.5_Installer.hfs' from 'Install macOS Sierra.app' ? I also have 'macOS Sierra 10.12.3.dmg' file. I am looking for 'PartIMGCreator.exe' within AIOBoot but unable to find it with 'AIOBoot' folder ? Where it is ? Sorry, but if I back up the MBR to the 30th sector or otherwise, it could also be corrupted because the user would probably install other bootloaders. Grub2 is usually larger than 63 sectors. I don't have a MacBook Pro/Air to try, but it works for Hackintosh. After you have created the installer using Disk Utility on macOS, or in any way, back up the partition containing the installer to a file. I named it "OSX_10.12.5_Installer.hfs". PartIMGCreator.exe has been removed in recent versions. You can run AIOCreator.exe and switch to the PartIMG & VHD tab.